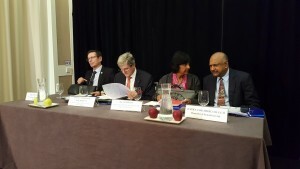 Left to Right: United Nations Assistant Secretary General in the Office of the High Commissioner for Human Rights, Ivan Simonovic; President of Belgium’s Constitutional Court, Baron Marc Bossuyt; Commissioner with the International Commission against the Death Penalty, Justice Navi Pillay and Chancellor of Guyana’s Judiciary, Carl Singh. Guyana and other countries that have enacted laws to sentence convicted terrorists to death should take steps to repeal them and also abolish the death penalty altogether, top international advocates against the death penalty said Wednesday. Commissioner with the International Commission against the Death Penalty, Justice Navi Pillay told a news conference ahead of a judicial colloquium with Guyanese judges and magistrates that she hoped that Guyana would review its Terrorism Act that has 12 provisions for the death penalty. “You don’t pass a law just because something terrible has happened. Law is not done emotionally. The rule of law follows international standards and Guyana is very much a part of the international community, has passed many international treaties and so they are bound to pass laws that are certain and definite and not responding each time to terrorism acts committed here, France or wherever,” she told a news conference at the Marriott Hotel. Although Guyana has amended its law to provide for the death penalty only if joint service members or members of the judiciary are killed in the line of duty, quite recently a High Court Judge sentenced a man to death for the murder of two brothers at Victoria, East Coast Demerara. Pillay stressed the importance of complying with international law by not merely having a 20-year moratorium on the death penalty but legally abolishing it. “We will lend our voice to ask Guyana to advance forward and not go backward,” she said, adding that Guyana should be proud that no one has been executed in 1997. The panel, which was due to deliver presentations to the judges and magistrates, has already met with Attorney General and Minister of Legal Affairs, Basil Williams and was scheduled to hold talks with Public Security Minister, Khemraj Ramjattan. Pillay noted President David Granger’s outspoken commitment to deal with the protection of women and children and addressing inter-personal violence. Guyana is the only South American country with the death penalty on its law books.